The Notre-Dame in Paris has been devastated after a fire ripped through its roof and burnt large parts of the cathedral. The medieval roof of the cathedral was almost entirely destroyed but photographs from inside show that much of the structure remained intact, after an hours-long firefighting mission. One firefighter was reported to have been seriously injured in the blaze. The sacred objects and artwork stored in the cathedral were secured. Emmanuel Macron has committed to rebuild the cathedral, and has promised an international fundraising effort to restore it to its previous state. While the cause of the fire is still unclear, authorities said they were believed it to have been started by accident. Live footage shows the fire tearing through the roof of the cathedral, with smoke billowing out across Paris. The cathedral is located on a natural island, Île de la Cité, right in the centre of Paris. Initial reports suggest the fire was started in the cathedral’s attic, and the visible parts of the blaze do appear to be coming from the centre of the roof. That area has scaffolding around it for building work, as can be seen on this photo. The fire brigade has said that the blaze may be linked to that renovation work, according to French media. Donald Trump has responded to the fire, with speculation about how it could be put out. Emmanuel Macron has cancelled a planned address to the French people because of the “terrible fire”. The fire is now ripping through the spire at the top of the cathedral, which is a 19th century recreation of the original medieval spire. 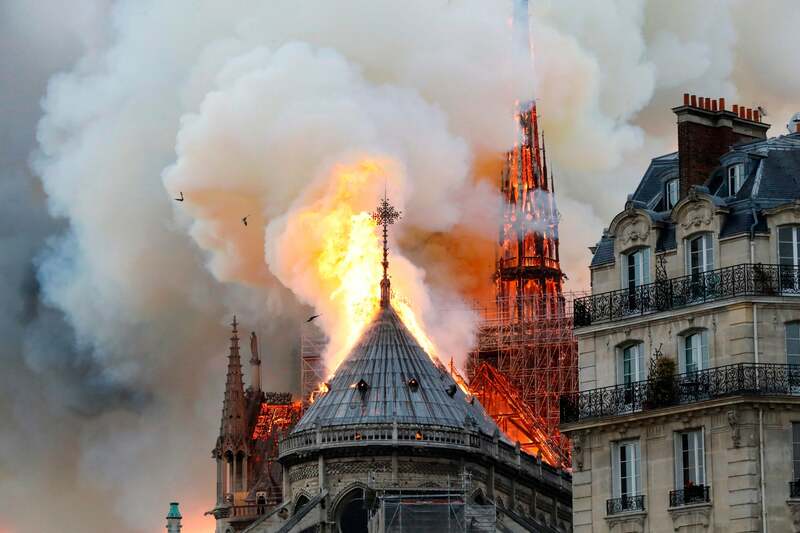 Numerous reports in French media suggest authorities are concerned that the blaze is connected to the renovation work, which is the reason for that scaffolding around the spire. The Île de la Cité – the natural island on which the cathedral stands – has been fully evacuated. People are gathering in nearby squares to watch on as the smoke billows across the entire city. Macron’s cancelled speech was pre-recorded, and was set to be aired later Monday on French TV. He had been expected to lay out his plan to address the citizen complaints that gave rise to the yellow vest protests that have rocked France since November. This photo from AFP shows the intensity of the fire and the damage is has already done to the spire, which is now entirely ablaze. Donald Tusk, president of the European Council, has responded to the fire with a gesture of solidarity. Various commentators on Twitter – particularly alt-right voices from the US – appear to be trying to push the suggestion that the fire might have been started intentionally. There is no suggestion at all that it was, and emergency services are still treating the fire as an accident.